The end of the week saw the culmination of six (actually rather short given the amount of work we put into them) weeks of work with the Western Europe team at Reebok Classics on event creative and production to support one of the brand’s biggest launches – the return of the iconic Aztrek. Now the Aztrek is steeped in history. It was the most covetable piece of streetwear around if you happened to be about in the 1990s. 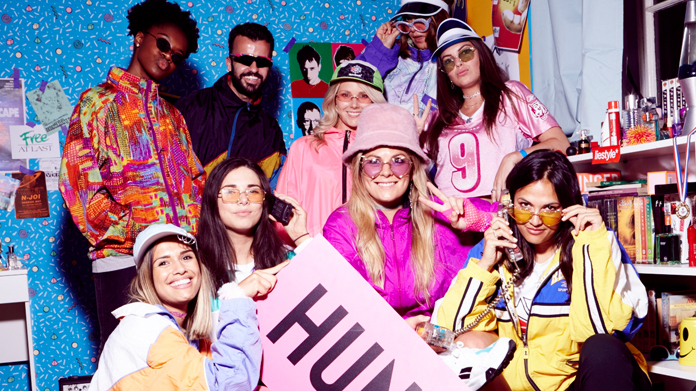 So it was that (alongside our good friends at INCA Productions) we were tasked with an event that enabled people to Re-run the 90s with the brand, bringing a contemporary spin to the brand’s heritage. Which was how we came to present Play On – a video games, fashion, design and music-inspired homage to the era. As guests entered the space they were taken through a TV tunnel that made it clear they were being transported back in time to an era of rave fliers, bucket hats, Streetfighter and rose-tinted glasses. With references to icons of the age – from Friends and Fresh Prince to Gameboys and Tamogotchi – the experience set the scene. That was followed by a trip through the Reebok archive and the story of the Aztrek from its first release to the latest iteration of the iconic silhouette as guests were transported back to a present-day take on the decade. From there an video game arcade invoked the spirit of the period as classics sat alongside VR games that once again updated the genre, blending old and new. Once through that, guests stepped into the Style Studio in which Hunger Magazine stylists would give them a 90s makeover in a bedroom set to recreate the iconic postered bedroom shots of the era. Hunger’s fashion photography team created leave-behinds that no one could resist posting (there’s one above of the team before the chaos kicked-off). It was an artfully-brokered partnership as we once again blended heritage and a very modern take. After that there was the party floor that evoked the spirit of 1990s rave culture complete with rave fliers promoting club nights named after classic Reebok styles. The wonderful Oliver Lancaster put the designs together with us and his lo-fi take was bang-on for the event. To provide the entertainment, we brought in the team at NTS who put together a who’s who of top-class talent as Denis Sulta, Eclair Fifi, James Massiah and Tiffany Calver (to name a few) took control of the warehouse party. Night one we hosted over 800 influencers, media and retailers from across the London and Europe for the launch of the new shoe. Night two was open to the public and we could have sold the whole thing out three times over as another 800 or so people stormed the venue and enjoyed all of its delights. Oh, and those members of the public who did turn out were treated to a set from Mahalia, who put in an appearance to bring the whole thing to an epic close. One of our favourite ever experiential deliveries. Challenging. But then the most rewarding ones are always challenging, aren’t they?